…Or, in this case, better known as Middle Ear Cancer. I’m still in the dark myself — and awe — about recent events, and I’ve been doing my own research at night. So I think it’s only fair that I provide some helpful links and photos, to help others better understand what’s going on. However, I should say that I first started losing my hearing in my right ear in 2003. At the time, I thought this was somehow related to my ethmoid sinuses. It wasn’t. And I’ve suffered now from an Inner Ear problem on both my left and right side since February 2007, another debilitating condition which I can add to the Epilepsy (diagnosed 1996). I can’t help but feel that all of this is somehow connected. My ENT thinks so, too. The other terrible condition: Meniere’s Disease. 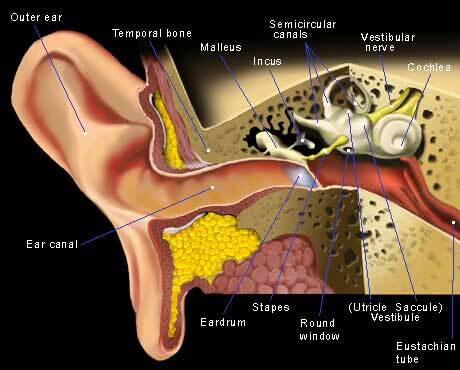 Like Middle Ear Cancer, the symptoms of Meniere’s are very similar — except for the ear pain which is excruciating! — and I wouldn’t wish this on my worst enemy; it’s said that Vincent Van Gogh suffered from it. The symptoms for me, and I’m sure others, too, consist of the following: Tinnitus, Deafness in either one or both ears (for me, both), fullness or a “pressure” feeling on the affected side(s), a dizzying/foggy feeling in the forehead area of the affected side(s), occasional fatigue and memory problems (at least for me), nausea and vomiting, and worst of all… VERTIGO! The ear pain is recent, but vertigo is what makes this conditon horrible to live with. And it’s not to be confused with regular dizziness or that “feeling of faintness”. No, sir. Imagine you’re fine one minute, the next it feels like you’re on a carnival ride or a sinking ship… Imagine gravity around you ceases to exist and you hit the floor with a heavy shifting/spinning sensation… Imagine somebody kicking you in the side of the head and throwing your whole equilibrium off, upsetting your balance to the point where you vomit all over yourself and have to crawl with your face glued to the carpet. Now you’re getting an idea of what I have to live with, and for well over a year. There is an over-the-counter vitamin called Lipoflavonoids, and while there is NO cure, I have to take this supplement twice a day like my seizure meds. The vitamin is a last resort to try and “sustain it.” Once again, there is NO cure. Now let’s throw in a skin growth shaped like a peanut-flavored M&M, on the right side — but keep in mind both my ears are screwed up — located between the middle and inner ear, and pressing on the auditory and vestibular nerves. It is not benign, but I plan on getting a second opinion regardless. I’m keeping a positive mind that another doctor will tell me it is pre-malignant. Either way, a neurosurgeon is the guy who takes the growth out, and since I’m practically deaf already, one eardrum must go. But it should be known that when it comes to ear tumors, the mortality rate is rather sketchy. Like I said, trying to keep a positive mind where I’m at. With that said, the next few months ahead will be filled with LOADS of doctor appointments and possibly going under the knife, but please stop by every so often. I’ll have stories coming out in over a half-dozen anthologies, and such webzines and print magazines as: Polluto: The Anti-Pop Culture Journal, Midnight in Hell, Written Word, Sein Und Werden, Nova SF, Jupiter Science Fiction, Tales of the Talisman, Black Ink Horror, Aoife’s Kiss, The Willows, and many many more. Are you a fan of Steampunk Horror or steampunk-related clothing and culture? Do you enjoy pulp SF or adventure stories? How about supernatural tales with a Turn-of-the-Century, Lovecraftian feel? 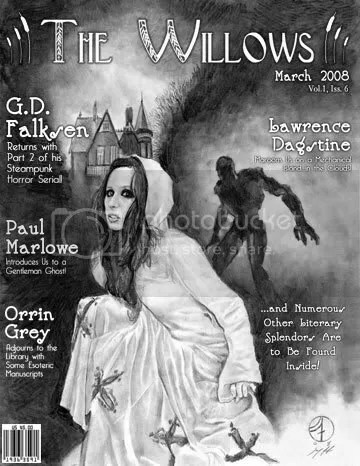 Then check out THE WILLOWS! I’ll be Feature Author in their May 2008 Anniversary Issue. 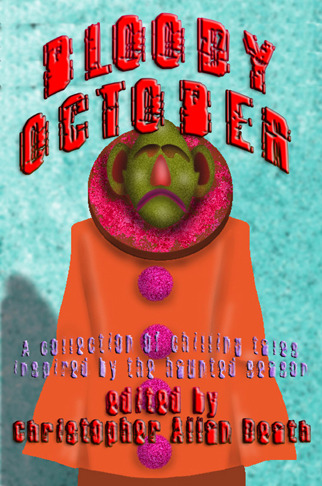 With stories by Lawrence Dagstine, G.D. Falksen, Steven Shrewsbury, Andi Newton, and MORE! Edited by Ben Thomas and Skadi meic Beorh. And congratulations to Frances Rowat for winning the story title contest! Today’s acceptance is to Rachel Kendall’s very popular existentialist and surreal literature publication, Sein Und Werden. Available in the UK. 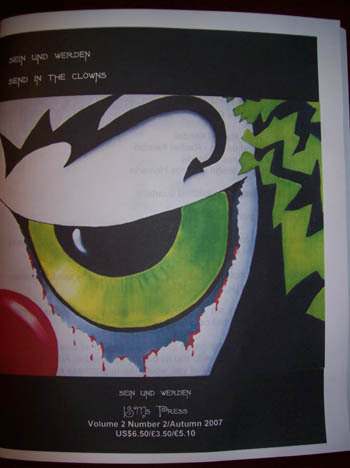 They not only feature experimental prose, but artwork and poetry in their print version(s), too. Each issue has featured renowned names in the British short story arena, and has its own unique theme. Next issue’s theme is a “mathematical-meets-speculative” one, if I’m not mistaken (or ologies). The current issue is themed: Clandestine Encounters. My most recent acceptance comes to the May update of Silverthought Press Online, and it should last straight through the end of June. In total, this would be my 59th acceptance with them — yes, that would be correct, fifty-nine — over the past three years. Silverthought is not only an online webzine and peer review/writing discussion forum, but ALSO an independent publisher of high quality novels and anthologies. They’re well known for breeding talent in the short story arena. And they’re now a paying press, too. 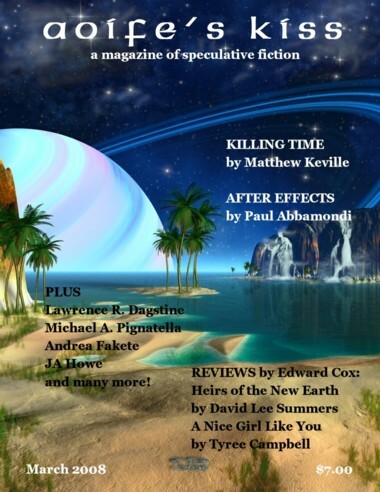 May 2008’s update features fiction by: Kimberly Raiser, Gayla Chaney, Lawrence R. Dagstine, Thomas Henry Dylan, Isaiyan Morrison, Justin Oldham, Mike Philbin, Pavelle Wesser, and excerpts of David S. Grant’s new books and an exclusive interview with the author. SATIRICA Anthology – Press Release; Coming Soon! The darkest, most twisted speculative fiction anthology in the history of the known universe has now found a publisher! Satirica will be published in a hard cover edition by Cowboy Logic Press in SUMMER 2008, with paperback to follow in SUMMER 2009. Satirica will be printed in the UK and USA, and distributed through all the big names, including Ingram, Barnes & Noble, and Amazon. It packs 110,000 words into over 300 pages, and includes 24 of the hippest stories by 20 of the hottest new authors in the field of speculative fiction. It will bend your perceptions of social reality to the breaking point, and you will never look upon contemporary society in quite the same way again. 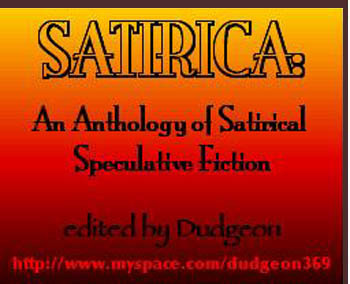 A truly international collection, Satirica includes authors from Canada, the USA, Scotland, England, Wales, Australia and New Zealand, in a compilation of the very best of contemporary satire and social science fiction.